Despite The Times’ best efforts at minimizing the rail option, the Rockaway Beach Branch may yet have a champion in a position of some power. A few weeks after Gov. Andrew Cuomo’s office awarded a $500,000 grant to the group championing the QueensWay rails-to-trails proposal, Assemblyman Phil Goldfeder of Ozone Park has called upon the governor to give money to a feasibility study for rail as well. Goldfeder said at the meeting that he will continue to push forward with the idea of revitalizing the LIRR because people living in the Rockaways and Southern Queens desperately need better transportation options than the ones that are currently available and because it would benefit all of Queens. Goldfeder said that while he has met with the governor’s office before regarding reviving the LIRR line and improving public transportation options in general, this latest meeting is in response to the QueensWay getting the grant money for the study. “I wanted to make sure that they were aware of the many different options and desires for that land,” he said. According to The Tribune, residents in southeast Queens are more in favor of a rail reactivation than those further north up the unused right-of-way. Such a rail line would provide better connections to subway lines and could ease congestion on Cross Bay Boulevard. But their neighbors to the north have a different take on things as they worry that a rail reactivation would impact the Forest Hills and Rego Park houses unwisely built on top of a rail line. Meanwhile, Goldfeder and the Woodhaven Residents’ Block Association are engaged an interesting war over ideas as well. The right-of-way runs along the eastern edge of Woodhaven, and residents there feel both the QueensWay and the Rockaway Beach Branch reactivation would have a negative impact on property value and quality of life in the area. So not only is this response the Grand Poobah of NIMBYism, but it’s blatantly wrong as well. Although it pains me to admit it, an active park would have a positive impact on property values and so too would the rail line. Goldfeder has said before that doing nothing that benefits no one is not an alluring option. And so a great land use and transportation debate takes shape in Queens. On the one hand are park advocates, on the other are rail advocates and on the third are people who just want to be left alone. The NIMBYs might actually win because moving forward on either a park or a rail line may face too many political and economic obstacles right now. Goldfeder, however, deserves the support, and if he can become a leading voice for rail reactivation, such a cause could have an ally to rally around in Albany. Indeed. Getting rail’s foot in the door is the first step. The map posted above strongly hints that the subway would be the more practical option anyway. Of course. 🙂 You aren’t going to convert the Rockaway Beach Branch line into a commuter rail line, are you? if am not mistaken it was originally LIRR but they sold it to the city….? I think it came to the city in the deal that got the city the current IND Rockaway Line, but either way the city owns it now. @Someone: Goldfeder is proposing LIRR instead of subway (for some reason). Yeah, I get it. Goldfeder wants to have the MTA make more money by using it as a LIRR route rather than a subway route; tickets for the LIRR usually cost more than a trip on the NYCS. What baffles me is why there should be two LIRR routes to the Rockaways (don’t forget the Rockaway Beach Branch). (don’t forget the Rockaway Beach Branch). Uh, I meant to say the Far Rockaway branch. One upshot to LIRR service is that you could, theoretically, have a direct connection between Newark and JFK. Is that the highest priority? Probably not. But LIRR service might make things more flexible and once ESA is open you’d have more space to work with. If we were truly planning through running sometime in the future, we would have ordered the M7 fleet with the same specs, but with under-running 3rd rail shoes for the LIRR – then we could have trains making runs from Trenton to Babylon (via Newark, NYP/GCT, Woodside, Jamaica[JFK])and so forth. and Secaucus Junction (Transfer), of course. If the M9 fleet of cars is being designed the same way, the LIRR could actually run through service from New Jersey to Long Island. @someone…I’m willing to bet $500 that ain’t gonna happen. Extra cost for to little perceived benefit – cost-benefit analysis. from Brooklyn to Manhattan to Queens to Brooklyn and then back to Queens. The ROW is entirely in Queens. The Brooklyn border is approximately 2 miles west. Ben, is there a reason you chose that particular map? I read that document and there were a number of options for extending the LIRR, including one that just stopped at Howard Beach. That one always seemed like the easiest one to build because it maintained everything else as it is, you could even build the line without the stations. For just a few miles, it seems like there could be a compromise where the train itself is put in a box of some kind that would contain the noise for the protection of the neighborhood. Said “box” could in the future have walking and biking trails built on top of it. I know if would add a lot to the cost of a project whose main selling point is low cost, but the cost would be in the hundreds of millions, not billions. In dense crowded NIMBY situations, sometimes politically acceptable solutions just cost more. It’s the only map I had access to. Do you have a digital copy of the document? That, does not make sense, well neither does the LIRR option. And you will have to create a tunnel portal. The tunnel portal already exsits, now all the MTA has to do is to connect the short tunnel fron the Queens Blvd line to the Rockaway Beach ROW. The LIRR option makes a bit more sense because there’s already a junction from this ROW to the LIRR; however, the branch runs into the A train tracks just south of Liberty Avenue. Building over a cut-and cover tunnel has been done quite a bit on the BART system, both at the Ohlone Park in Berkeley (http://goo.gl/maps/1Q2Lu) and between Colma and San Bruno BART. Its certainly possible to do both rail and a park, as in my first example. Whether the park makes any sense still has to be asked, but my point is that while building a park first would tend to preclude rail, building rail first wouldn’t necessarily preclude a park. That would be a good idea… for an extension of the Canarsie Line. However, the embankment is already existing, and tearing it up and building an new cut-and-cover tunnel in its place would be expensive (not to mention that locals would still oppose this). I enjoy the M train’s new sprial service route. 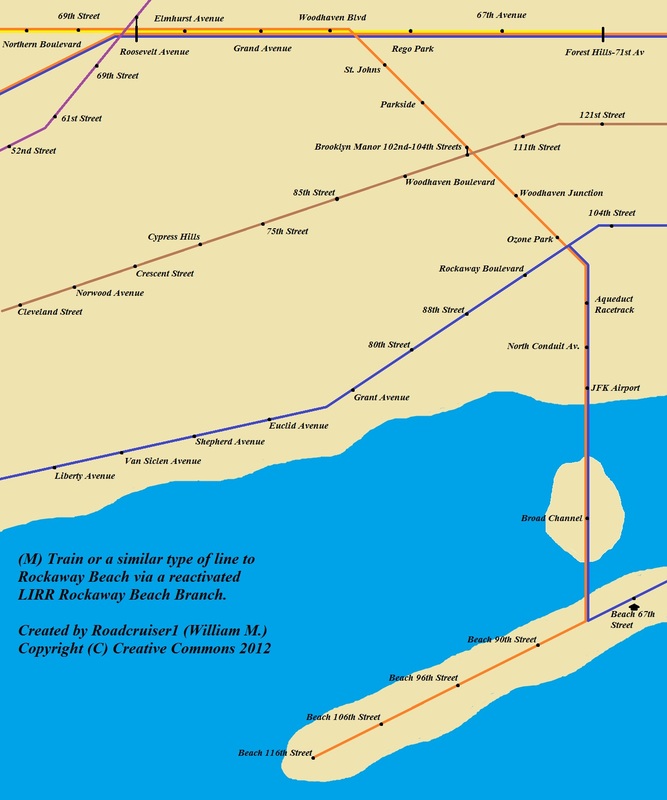 The map is from a document that included other options for connecting the Rockaways Branch to the Queens Blvd local, the R. This map didn’t include that option, but the legend remained the same for all maps. That (M) map was made by me to show how the line would be utilized. I also made a map with a (G) extension as well. I didn’t decide on an (R) option. The (R) is already way too slow as it is. An extension would slow it even farther. It would also have to circumnavigate in a long C shape making it redundant. The (M) isn’t too long or slow so I considered that option, and the (G) isn’t that long of a line so I considered that option. I didn’t do the (R). Well, if the extended the R to the Rockaways, its not like most people would take the R terminal to terminal. People who live in the Rockaway, for example, do not typically regularly take the A train to Inwood. People from Jamaica don’t typically take the F to Coney Island on a daily basis. Some of the shorter routes, I can see some people taking terminal to terminal, like the E or even the 1 for their daily commutes. But the longer routes aren’t meant for people to take the trains from end to end. So it doesn’t matter that either the M or the R have long lines if they go to the Rockaways, as anyone taking the Queens Boulevard local would likely be getting off in Queens or Midtown Manhattan. 1. While passengers don’t ride the whole line, the train crew does, and there are human fatigue limits to what makes sense there. (There may also be union rules, I don’t know.) I have heard it said, though I don’t know if it’s true or not, that that is why the F runs express on Queens Blvd late at night, though of course the late night local A and 2 are still plenty long. 2. Creating a through route forces the system to find a way to balance the demand on the two halves. Right now both the 4th Avenue Local in Brooklyn and the Queens Blvd Local are fairly low-demand routes, so the R makes sense as a through service. If running the R on this new line led to it becoming a high-demand service, you could either under-serve the new line or over-serve Brooklyn, or create some confusing mixed system where every other train turns back at Whitehall. This problem can be overcome (especially thanks to numerous mid-route turning options on the Broadway line in Manhattan; this would be harder on the 7th Avenue line for example) but it is a complexity worth thinking about. Of course this problem can also be addressed thanks to the ability to choose from among different lines: for example maybe the demand profile of the M better matches this new extension than that of the R, just like the MTA swapped the B and D designations in Brooklyn when resuming service there in 2004 to better match the demand profiles across the northern and southern parts of those routes. The R option could be considered if the R was made express in other parts along the line, but it isn’t. The G wouldn’t work. Firstly, there is no capacity on Queens Blvd. for the G. I live in Greenpoint, and I can’t tell you what a huge pain in the neck it is to get to Queens, especially on the weekends. Secondly, there is no direct route to Manhattan, which is a huge selling point to any potential service addition. Now, if you wanted to build a new station at Queens Plaza for the G, and then extend the G via the G via the Montauk branch), maybe you have a point. BTW, there is plenty of room at Queens Plaza to build a new station. There are lots and a few factory warehouses around the station. The SIRT was plunked into an open cut back in the 1960s in the New Dorp-Grant City area to get rid of the grade crossings and the street-level running of the line. Something similar could be done on the Rockaway Branch north of Union Turnpike or Metropolitan Ave., if the locals there are so dead set against restoration of the embankment (You could even get a 2-for-1 by completely covering the line in that area and giving the park advocates their strip of land from Rego Park to the north side of Forest Park. Unlikie tunneling under a street or avenue, buried utility lines should only be a big issue at the cross streets, and with no traffic above, construction to take into account vehicular needs as with the SAS work would be far less of a hassle). I wonder if those one, two, and three blocks away from this line are still dumb enough to believe this wouldn’t be a positive. If it were not for Queens NIMBYs, the Montauk Branch would have been a subway line to the 63rd Street tunnel. They feared racial change. When did that occur? Was that ever a serious option? I had always thought that should have been done. Why does the legend say “Rockaway R train”? That implies that the R train, instead of the LIRR or AirTrain, will be using this line for service. And why does the branch run on the same tracks as the A train for about a mile? I’m pretty sure that’s illegal. the A train uses part of the right of way left over from the LIRR branch. They would be able to use separate tracks with no connections along the same right of way if they really wanted to run different services. pretty sure the ‘illegal’ part would be running different service on the same tracks. The ROW was four tracks I believe, so there would be room for separate subway and commuter rail services, at least through Howard Beach. You’d only need one track. I don’t think the area has enough density to justify subway service (and if you think there are NIMBYs now, just try proposing rezonings). Commuter rail might be reasonble if it could be done cheap. It could certainly be done cheap anywhere but here. You’d have to widen the right of way to include platforms for the LIRR, through Howard Beach if you wanted to go that option. Or since the A train these days doesn’t go to the Rockaways, there’s no real reason they couldn’t decide to connect the whole thing back to the LIRR, and simply run the LIRR to the Rockaways from Penn Station via the mainline. This could go any number of ways. The LIRR already goes to the Far Rockaways, so this would probably be redundant. The best thing to do is to extend one of the Queens Blvd local services into the Rockaways. (4) turning the Rockaway Beach Branch north of the Bay into some sort of “Queens Scoot” service. I dunno whether it should be LIRR or NYC Subway or what. Actually, that’s not a good idea. What is the chance that a major hurricane is going to come within the next few years? Not likely. This ROW was actually abandoned by the LIRR because the old viaduct was being washed out so often. If it was abandoned by the LIRR because it the viaduct was being washed away so often, why should it be rebuilt now? The bridges over the East River didn’t get washed out. The A train over Jamaica Bay was cheaply built over wooden trestles. All they have to do is build a bridge made of steel and concrete, and the broad channel crossing will be completely fine. The regular road bridge over broad channel, carrying cars and made of concrete, sustained no damage. As for abandoning the Rockaways for housing entirely, plenty of other places that weren’t directly barrier islands also flooded. Downtown Manhattan, the Lower East Side, Red Hook, Huge parts of Staten Island. So are you saying they should be abandoned as well? Even in these places, though some housing probably is on ground too low, if the houses were better built (including being built on stilts) there’s be a much lower chance of destruction in a storm. Large parts of Broad Channel and the Rockaway peninsula have houses which were built on stilts. Those stilts were just made of wood. I disagree on the last point…. nursing homes and such shouldn’t be on the Rockaways because of evacuation purposes. I have no private with private development like Breezy Point (they have their own security and fire) and such. If private citizens want to live their it’s fine with me as long as it’s “build at your own risk”. That’s not to say there should be strict building codes to minimize potential loss of life. Arvene by the Sea (a huge townhouse developement) is a nice community – and the newer parts of it fared well because they built with storms in mind. Public housing I think we can all agree does not makes sense to exist in a place like the Rockaways – it’s too risky. Let those who can afford the risk build there. The funny thing is just about all of the homes along the right of way were already built before the line was abandoned…. Just look at http://gis.nyc.gov/doitt/nycitymap/ from the 1951.
yeah – back then ppl didn’t complain about such things. they just thought it was a way of life. People were less whiny back then. Less selfish. More polite. Better overall really. Not true in general. Not at all. About rail lines, however, yeah. Anti-rail hysteria was at a low ebb in 1951. Notably, the NIMBYs of today are largely the sires of the first wave of suburbanization. They tend to be the most narcissistic people in society. Their children (most of us), whatever their flaws, seem much less bad. I don’t take any plans to sent LIRR trains to JFK over Airtrain tracks seriously. While they they may look good as lines on a map, they ignore issues with platform length and curve radius that make running commuter rail to the terminals a fantasy. It would certainly be much more feesable to run a line to Howard Beach, but I am not sure what would be gained over Jamacia. They probably aren’t going to use LIRR equipment on the line, only NYCS or AirTrain equipment. Actually, scratch the inter-running to the AirTrain and you’ve got a new subway line. But then you end up taking up valuable LIRR terminal and mainline slots with a low capactity system, and that is after you work out the technical and jurisdictional/regulatarory issues. Without connecting to the LIRR, but instead going to the Queens Blvd line directly, that is. You’d have to build the track connection and design a totally new Airtrain vehicle capable of operating on third rail power. It’s difficult on many levels, but hardly impossible. The rewards are real: faster trips from JFK to most everywhere, especially Midtown and downtown Brooklyn; a dip in the hellish traffic on the Van Wyck; a better return on the initial Airtrain investment. Also, you’d have to take into account the fact that the AirTrain and the LIRR are owned by different companies. I’m contacting rep Goldfeder to keep up the good work, he needs to know that there are people that want this to succeed, I live in Rego Park and would probably be directly impacted, but I think the benefits to the city can’t be worse than what has been done by the monster malls that I have around me. It’s poison that this is seen as such a hyper-local issue. Rail would truly affect the whole city positively. They could use this to redevelop the Rockaways, if this connection is reactivated or connected to the subway (or back to the LIRR). There is no point in redeveloping the Rockaways. They’ll most probably be destroyed again. The main cases for the Rockaway Branch are cross-Queens transit and JFK access. There is already JFK access. Take either E or A to Airtrain, and transfer. Reopening the Rockaway Beach LIRR won’t dramatically change a trip to JFK. It’s crappy, and indirect. Airport access done right would be the subway to a major terminal. I don’t really know what they were thinking sticking it in a periphery are like Jamaica or Howard Beach. Land is cheaper out there, compared to building it closer to Manhattan. It’s already public land, so I’m not sure that’s the issue here. It was more about NIMBY-avoidance or general transit use avoidance. At the time, the Rockaway Branch was even available. Yeah, but look at Japan, which has been destroyed by tsunamis many times. And yet it is still a lively country. It took a while to redevelop Japan, but each time, the communities rebuilt because they had determination. Same thing with the Rockaways. They might be destroyed now, but with determination, people would be motivated to move to the Rockaways again. You could also upgrade the housing stock there. Houses could be built on stilts and be built to better withstand a storm. Also, the Rockaways can be used like Fire Island. Few people live year around in Fire Island, but its got a thriving summer community. It could be even more valuable as the Rockaways are closer to Manhattan. Even better, the Rockaways could be redeveloped into an amusement park, like Coney Island. The Rockaways are a fine location for parks and beaches and summer housing. A horrible location for permanent housing. There used to be an amusement park on the Rockaways. As to casino – they do nothing to help an urban environment… that’s why they are usually in places with terrible economies… which even though it gives a few jobs – usually makes the ppl around it more poor because they lose money in there. Hotels – yes…. but of course that would be based on how fast they can get to other parts of the city. Long Beach on Long Island just had a luxury hotel open not too long ago that was doing well. On Long and Lido Beach(s) old hotels actually became condos. Maybe you can find some slope-browed climate change denying billionaires to invest tens of millions in such an amusement park. ‘Cause, you know, if a hundred-thousand dollar house is a bad idea, a six million dollar Ferris wheel sounds like a great idea. Let me know. I’ll start buying puts right now. The Rockaways used to have an amusement park… it became defunct. In fact, many of Japan’s communities *relocated* when it became apparent they’d idiotically built too close to the ocean. We shouldn’t even want them moving to the Rockaways, since we’re going to have to pay to rebuild them again. Determination in the face of inevitability is called stupidity. Positively. What do you think the locals would say if someone were to propose shutting down the Forest Hills LIRR stop? This could be a direct route to Grand Central in 2019, and would provide an easy transfer for a ride to the beach in the Rockaways. People are nuts. I live in perhaps the most whiny neighborhood in the city, the fact that we don’t even have bike lanes its indicative. I’m sure they’ll be complaining up a storm, like “Pete” who was advocating for Queensway claimed to want a bike lane so that he can ride his kids to school. His name was “Peter”. He was on the Queensway board. Anyways, this would probably be the most used subway line in the system if it’s opened as a subway line. Yes, contacting Goldfeder is a good idea. Perhaps transit proponents should start a petition for Rockaway Beach Line reactivation and send this to the governor and the mayor? I sure hope they succeed. As a planner at a consulting firm that may very well get the bid to design this sort of thing and make recommendations to decision makers, my personal view is “can we reduce commute times to midtown? Express bus riders in that area have a hellish commute on the QM 1-10, and other riders take a bus to the E or F train. Are we going to attract new ridership at all? Or is this project simply to make commutes easier for existing riders? Many or our projects as of late have been to reduce commute times (SAS &ESA) since our commutes are outrageous. To illustrate, let’s use this commute as an example: A house near the proposed “Parkside” stop- I used “Yerman’s Irish Pub 7026 88th Street Glendale, NY 11385” as our starting origin and “Deutsche Bank 345 Park Avenue New York, NY 10154” as our destination. While Google Transit Routing claims that this is a 45 minute trip, I figure this. 1 – Walk to the bus stop – Google says 6 minutes – I say that my 57 year old mother (daily LIRR rider) will do it in 12 minutes. 5 – 5 mins to get from 53/Lex to Deutsche Bank – I counter that 5 mins to exit station due to escalators, 2 minutes for one short block and 10 minutes for 2 long blocks and 5 minutes to get inside and get to correct floor – 22 minutes. Total – 12 + 30 + 10 + 15 + 22 = 89 minutes. Remove the Bus (30 minutes) and the bustrain transfer (10 minutes), 89 minutes becomes 49 minutes door to door assuming the service skips Queens Blvd…. An issue we have come across with both NJT and LIRR’s more urban station is a lack of frequency (Ampere in Newark – Laurelton, Springfield Gardens and St. Albans in Queens). The LIRR will have to run frequent service on this line (6tph+ offpeak; 15+ peak)- I will note that this may actually be possible after ESA is complete! Another Option I can see is an all-express line running on the Current E, turning south onto the RB line, turning west onto existing A trackage at the Ozone Park area, running expressinto Downtown Brooklyn and Lower Manhattan, in a giant express circle – platforms can be constructed in the center of the tracks so a rider can catch the first arriving train in either direction. 1) It’s a good idea, but Google isn’t that much of a reliable source. 2) Depending on the day’s circumstances, the commute could either take longer or shorter than 89 minutes. 3) The “other option” which you are planning, will make your proposed line a huge backwards P.
4) This line could have a free transfer to QB local lines at Woodhaven Boulevard. In response to 1 – I was just illustrating the length of the commute. …4- Are you thinking of turning the line into a Franklin ave shuttle of sorts? I think that the trackbed rehab(ballast and bridges) and new signals, track and stations will cost no more than $75m – $150m Dollars. Actually, since the line is already owned by the NYCS, I was thinking that it would be a subway service (yes, kind of like the Franklin avenue Shuttle or the H train, but longer). Rehabbing the line shouldn’t cost too much- I’d say it would cost around $200 million. LIRR service is what the locals would prefer, faster to the city with connections to Grand Central. Two the existing Far Rock Line is really service to Gibson and the Five Towns it just terminates in Far Rock. The subway line to Far Rock could convert to LIRR service to Brooklyn and the line to Rockaway Park could switch to the Montauk Line at Glendale and ultimately to the new terminal in the Sunnyside Yard bypassing congestion on the mainline. There could be transfers at Aqueduct or Ozone Park between the lines for Brooklyn or Manahttan service. The state could legally create a subsidiary of the LIRR to run this service within the City Limits on a flat fare say $5-6 which would reduce the personnel necessary to operate the trains and with transfers between services. Service could also resume from Locust Manor through the Montauk Line in a similar manner as well. press conference with Congressmen Jefferies and Meeks to support the revitalization the Rockaway Beach Rail Line this Sunday, March 24th at 2pm. We will stand in front of the abandoned Rockaway Beach Rail Line at 99th Street and Liberty Avenue in Ozone Park. We would be delighted if you could attend and show your support! Press conference to support Rockaway Beach Rail Line TODAY, Sunday,March 24th at 2pm. 99th Street and Liberty Ave. in Ozone Park. Please join us! As a former Long Islander that has moved to the Rockaways, I have mixed feelings about this LIRR expansion. People keep bringing up the hurricane which messed up the tracks over the bay. This new railway would not help in this situation, because half the battle in commuting now is getting over the damn bridge. However, I do think that a way to get to Manhattan, especially Midtown, more efficiently is needed. I currently take the express bus, but Woodhaven Blvd traffic can be horrendous. I’d lean towards taking the LIRR, but experience with the high LIRR fares would give me pause. Another thing to take note of, the monthly fare from zone 3 (most of the Queens stations) to zone 1 is $210. An express bus pass is currently $55 a week. Just something to think about.